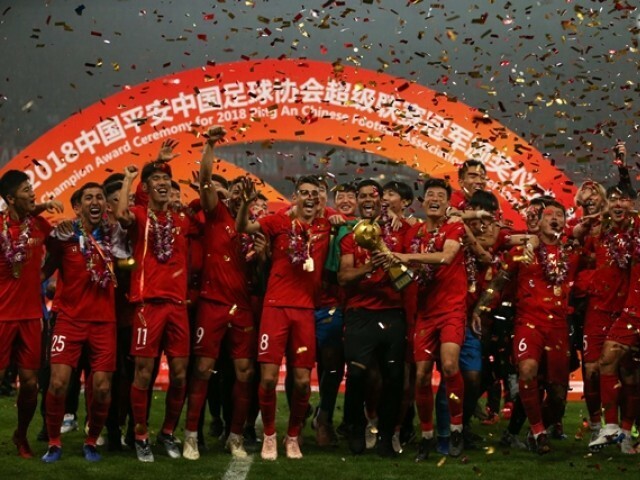 SHANGHAI: Shanghai SIPG are the new kings of Chinese football after winning the Chinese Super League (CSL) to end Guangzhou Evergrande’s seven-year reign as champions. AFP Sports pinpoints how SIPG were finally able to break Evergrande’s stranglehold on Chinese football — and where Fabio Cannavaro’s deposed champions failed. Oscar had a mediocre first year after signing for an Asian-record €60 million from Chelsea, but this season he has racked up a CSL-leading 18 assists, and scored 12 goals. He provided some of the ammunition for Wu Lei, China’s best player and the league’s top scorer with 27 goals. Swapping one Portuguese coach for another in Vitor Pereira — a former assistant to Villas-Boas — eased the transition off the pitch, while on it they kept faith with most of the squad that came second behind Evergrande 12 months ago. Fans were unimpressed by Pereira’s appointment and wanted a bigger name, but an 8-0 opening-day thrashing of Dalian Yifang set the tone. Serbian midfielder Nemanja Gudelj — signed in the close season as Paulinho’s replacement – was a notable flop and was shipped off to Sporting Lisbon. It says everything about the ageing nature of the squad that midfielder Zheng Zhi remains captain and a first choice — at age 38. The average age of Cannavaro’s starting XI against SIPG last weekend was nearly 31. SIPG — who won what was effectively the title decider 5-4 — averaged nearer 27. It suggests SIPG are much better geared for success in the coming seasons.